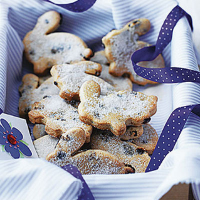 Children will enjoy making these buttery biscuits for family and friends over the holidays. They could also wrap them up as Easter gifts. Preheat the oven to 200°C, gas mark 6. In a bowl, beat the butter and sugar together, using a wooden spoon or electric hand whisk, until pale and fluffy. Beat in the egg yolk, reserving the white. Then, using a round-bladed knife, gently stir in the sifted flour, spices, lemon zest and currants. Gradually stir in the milk until the dough starts to come together – you may need slightly less, or a little more, milk. Tip the dough onto a lightly floured worktop and knead gently until smooth. Roll out to about 5mm thick then cut out the biscuits using a rabbit-shaped cutter, a 7.5cm round cutter, or shape of your choice. Place the biscuits on 2-3 greased baking trays and bake for 10 minutes. Remove from the oven. Whisk the reserved egg white very slightly, brush lightly over the biscuits then sprinkle with sugar. Return to the oven for a further 5 minutes, until just golden. Remove and place on a cooling rack. The biscuits can be stored in an airtight container for 2-3 days. Freshen homemade biscuits, by placing them in a warm oven for 3-4 minutes. Enjoy these biscuits with a fruit smoothie.